Anna Campbell gave up her comfortable western lifestyle and her job to travel to the Kurdish region of northern Syria in order to fight ISIS. She did this because the democratic Kurdish Rojava are demonstrably the only real good guys in the brutal Syrian civil war (the other main forces being the Assad regime, ISIS, other Islamist terrorists, Russia, Turkey, and the increasingly marginalised anti-Assad rebels who kicked the whole thing off). Of course she knew that she was putting her life in danger by taking up arms to defend Kurdish democracy from the threat of ISIS, but she wanted to help make the world a better place. Anna was killed last week as a result of Turkish shelling in the Kurdish town of Afrin. Turkey has continually intervened in the Syrian conflict in order to attack the Kurdish forces that are trying to drive ISIS and the other Islamist fanatics out of Syria. Turkey also stands accused of allowing Islamist extremists and military supplies to flow across the border into and out of Syria, treating wounded ISIS fighters in Turkish hospitals, and funding ISIS by buying their oil. Aside from their interventions in Syria to support ISIS and other Islamist terrorist groups, Turkey itself is in the grip of a brutal and repressive dictatorship. There are more journalists in Turkish jails than any other country on earth. Theresa May and the Tories don't care about any of this though. 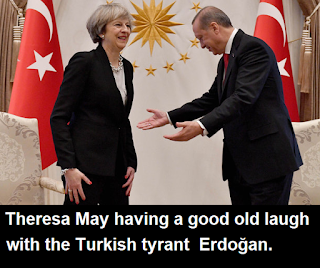 Human rights violations in Turkey, support for vile Islamist terrorists in neighbouring countries, attacks on the Kurds who are fighting back against ISIS ... it's all swept under the carpet because just like Saudi Arabia, Turkey is a marketplace for British weapons. Just a couple of months ago Theresa May and the Tories signed a £100 million fighter jet deal with the Turkish tyrant Erdoğan. And Theresa May and the Tories have also flogged an incredible £4.6 billion worth of arms Saudi Arabia in the full knowledge that they're a barbaric tyranny that funds, arms, and supplies terrorist fighters to ISIS, and also uses British weapons to commit war crimes in Yemen. 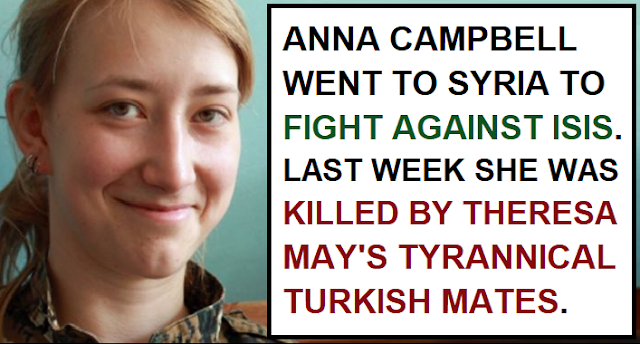 If Anna Campbell hadn't been killed by the British-backed Turkish forces behind her, she could just have easily have been killed by the Saudi Arabian and Turkish backed ISIS terrorists in front of her. 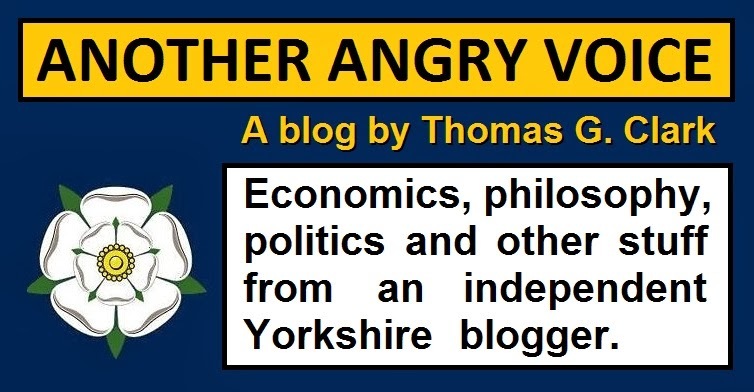 Both of the enemies that wanted to kill Anna and wipe out the emerging democracy in Kurdistan are ultimately backed by Theresa May and the Tories. Probably the worst thing of all is that it's only really in unusual cases where this Tories' grotesque foreign policy of hawking weapons to the most brutal and tyrannical regimes on earth ends up killing a British citizen that the British media pay any kind of attention. So often the British press are willing to turn a blind eye when it's gays and atheists being beheaded and crucified in Saudi Arabia; huge numbers of Yemeni civilians suffering Saudi war crimes and starvation; dozens of Turkish journalists languishing in jail for doing their jobs; millions of civilians displaced in Syria and Iraq as the Turkish/Saudi backed Islamist terrorists run amok; or hundreds of Kurdish democratic fighters being shot in the back by Turkish forces as they try to defend their region from Islamist terrorism. When Britain should be following Anna Campbell's lead and standing in solidarity with one of the few genuinely democratic movements in the Middle East, our government actually arms and supports the tyrants who seek to destroy them.